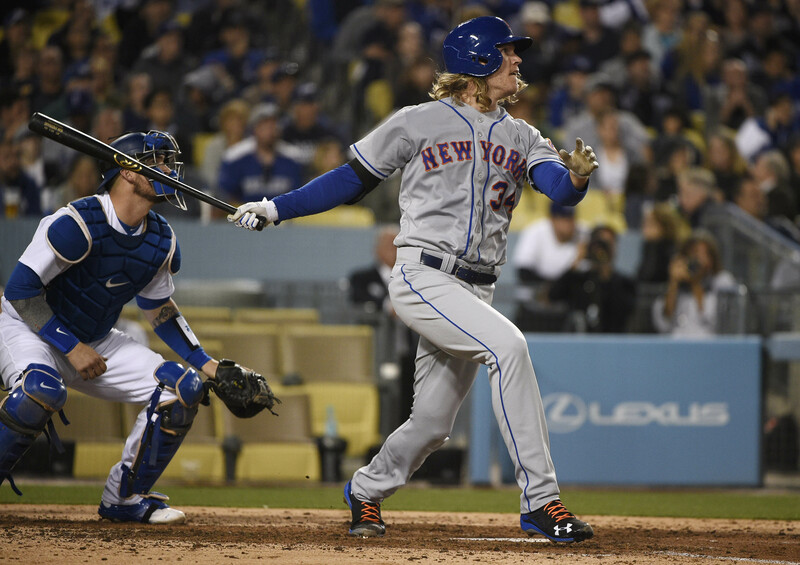 Noah Syndergaard and home runs were the story last night in Los Angeles. Entering the game, Syndergaard had only given up one home run in 38.1 innings pitched. However, Thor gave up two home runs on Wednesday night — solo shots by Corey Seager and Yasmani Grandal. Wait — that’s not the home run story. Syndergaard and home runs were indeed the story, but it wasn’t that he gave up two solo home runs. Instead, the story was that Thor hit two dingers. The three-run home run Syndergaard knocked in the fifth outdid the solo homer he hit in the third. In the end, it turned out that Syndergaard drove in all of the Mets’ runs en route to the 4-3 victory. The Mets did have an excellent opportunity to add more in the seventh inning. A Michael Conforto single followed by a Yoenis Céspedes double put runners on second and third with one out. Lucas Duda popped out to make it two outs. The Dodgers then intentionally walked Neil Walker to load the bases for Eric Campbell. The effort to add insurance runs ended in a Campbell-ian fashion. That is, he struck out. Going above and beyond, Syndergaard also pitched a pretty good game. The two home runs notwithstanding (the only runs he gave up), Syndergaard was effective, though not necessarily dominant. He pitched into the eighth inning for the first time this season. In those eight innings, Thor allowed six hits, walked one and struck out two. Fourteen of his outs came by way of the groundball; however, in the seventh inning, Yasiel Puig came dangerously close to hitting a third home run off of Syndergaard, but Michael Conforto caught it at the warning track in left field. Jeurys Familia entered to close out the game and Adrián González promptly led off the inning with a double. Grandal, at that point representing the tying run, grounded out to second for the first out. The next tying run at the plate was Joc Pederson, who grounded out to Asdrubal Cabrera to make it two outs. González scored on the play to make it a one-run game. Familia struck out Puig, the Dodgers last shot, to end the game. The Mets and Dodgers wrap up their four-game series tomorrow night, as the best pitcher in baseball, Clayton Kershaw, takes on the essence of baseball happiness, Bartolon Colón.